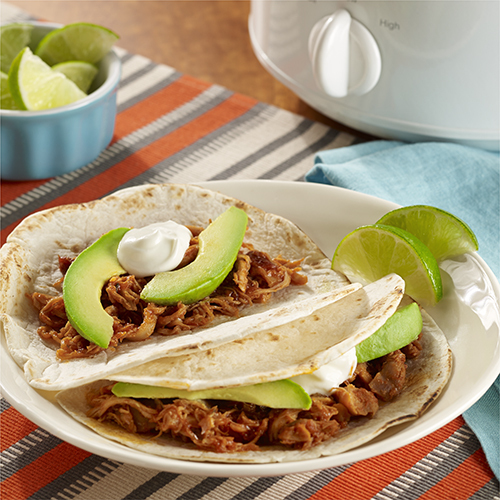 Honey chipotle chicken, prepared in a slow cooker, makes great tacos when served in flour tortillas with avocado and sour cream. My note -Chipotle peppers in adobe sauce are too hot for my taste, but I like the smokey flavor. I add a tablespoon or two of the sauce and 1 tsp. of smoky paprika for extra flavor without the heat. Spray inside of 4-quart slow cooker with cooking spray. Combine sauce, honey and chipotle peppers in slow cooker. Add chicken. Cover; cook on LOW 8 hours or HIGH 4 hours. Transfer chicken to cutting board; shred with 2 forks. Return chicken to slow cooker, stirring to combine with sauce. Place about 1/4 cup chicken in each tortilla. Evenly divide and top with avocado and sour cream. Serve with lime wedges, if desired.